A source close to Petite Savanne villagers displaced by Tropical Storm Erika said many are anxious to get a definite date when their resettlement houses will be ready for occupancy. The source said they are also asking Government if their new houses would be bigger than those provided for Dubique villagers who were resettled in Grand Bay, which some believe are too small. Chairman of the Resettlement Technical Committee, Lucien Blackmore confirmed that Government has acquired 49.6 acres of land at Bellevue Chopin to resettle Petite Savanne villagers. He added that work is being done on the necessary designs for houses and subdivision of house lots for the relocation of 283 Petite Savanne families. This phase of the relocation process is at an advanced stage, Blackmore said. However, a target date for completion of the entire process has not yet been announced. 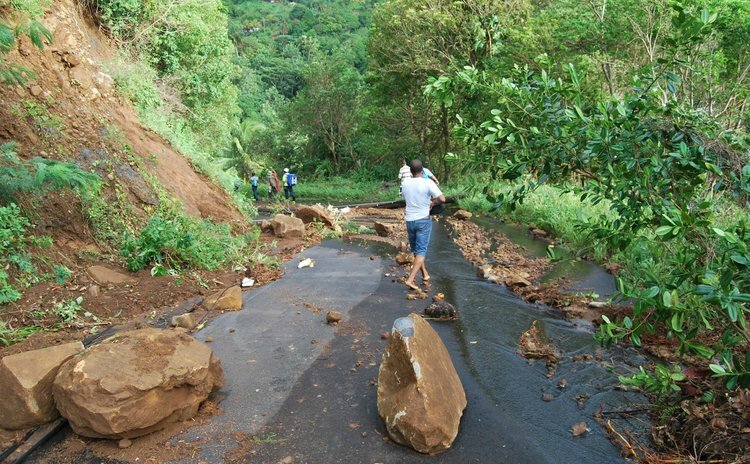 The source said some villagers are questioning the choice of housing site selection at Bellevue Chopin, claiming that it has excessive rainfall and insufficient land for agriculture. Many displaced villagers are farmers who are returning to Petite Savanne to farm even though disaster management experts deem the area a danger-zone. Blackmore asserted that the integrated resettlement plan has a social development component, which caters for meaningful consultations with the displaced villagers. He said housing is the first aspect of the initiative, which also includes provision of potable water, roads, electricity and internet service. However, the source said villagers have unanswered questions about the viability of farming at the resettlement site, which they perceive is too small. The source also disclosed that displaced residents formerly housed at St Aimee and Springfield guest houses have moved to rented private residences. However, some villagers are still occupying hotels in Roseau. According to the source, Government undertook to pay the rent for the houses, but in some cases rent has not been paid for two months or longer. This is partially because some landlords have not provided all documents and information Government requested to facilitate payment, the source explained. Meantime, a few persons have moved back to Petite Savanne permanently, the source said, and 45 persons live there now, including those who refused to relocate after the storm. The source said only a few persons were able to find jobs after their displacement and some are making regular trips to Petite Savanne to farm. Further, some villagers still have their belongings in Petite Savanne since they never got alternative storage space. Former Parliamentary Representative for Petite Savanne, Urban Baron, who visits the area frequently, said there is no electricity in the area except for what is provided by a small generator at a police outpost. There is no potable water supply, Baron said, so persons in the community are using water from natural sources for drinking, cooking and bathing. This has not stopped villagers from farming in the area and customers have been going there to buy from them. Villagers are also making bush-rum and harvesting bay leaves for private bay oil distillers, Baron added, noting that a few buses have resumed daily service to Petite Savanne.